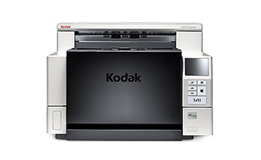 The Kodak i4850 Scanner is a perfect fit for medium & large size scanning departments and regional offices. With a daily volume of up to 125,000 pages per day, digitizing and managing a whirlwind of documents just got easier. The i4850 is Kodak's most versatile capture solution, so you'll be ready for production scanning the day you open the box. Kodak took everything they've ever learned about document management and built an entirely original platform to help you control information, automate processes and take productivity to new heights. The i4850 is a 150 ppm Duplex (Landscape, Scanning in Bitonal/ Grayscale/Color) production color scanner with a 500 page Automatic Document Feeder and advanced image processing features. The i4850 scanner comes equipped with a document printer; however, to utilize the printer, you will need to purchase and install the Enhanced Printer Accessory.